How does foam protection work? ‘Foam’ can describe many materials. For equipment protection, it is precisely defined and controlled. It must be rigid enough to hold the equipment yet soft enough to cushion it against impact. It must be capable of being shaped to support the equipment. It must have good presentation quality to reflect the value of the equipment that it protects. It must not have any adverse reaction with the equipment such as discolouration or adhesion. 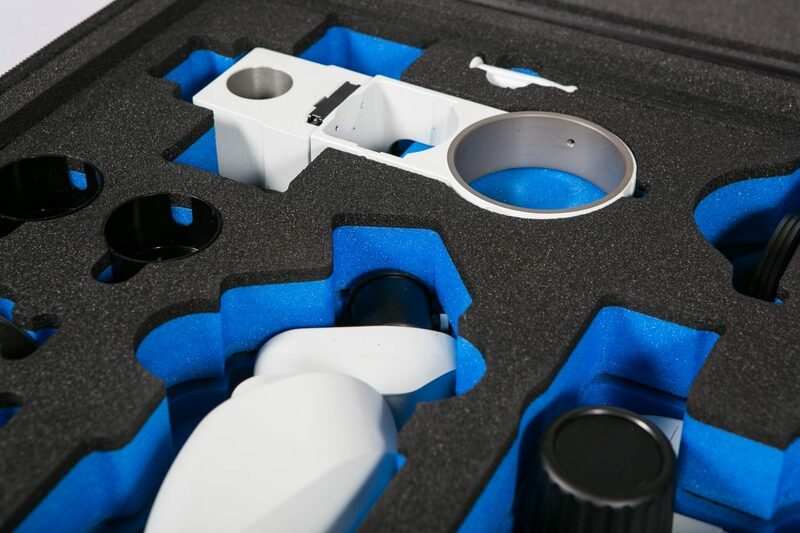 If you do not want your equipment to be damaged during transit – whether it be military equipment, medical or especially delicate and valuable – then you need to invest in tough protective cases lined with foam. What are the benefits of foam protection? Foam separates the item to be protected from an external point of impact or from collision with other items within the same case. If there is an impact this separation allows the item to decelerate harmlessly. Impact may last just hundredths of a second and show no evidence that it has happened because impact energy has been dissipated in the foam. During normal transport the foam can protect against prolonged vibration which might otherwise loosen fastenings. This basic protection can be provided by soft fabric cases. For higher protection values, foam is combined with ‘hard’ cases. In extreme impacts the foam decelerates the equipment before it can contact the inside of the case. The foam recovers and can cope with repeated impacts. The case itself may show damage because it is dissipating energy that could have been transferred to the item under protection. This is how the design is intended to work, sacrificing the case to protect the valuable equipment within. Recess shapes in the foam are designed to support the equipment at its strong points and selection of the right foam density is of crucial importance – too little support and the equipment may crash into the case. Foam density and rigidity are chosen to suit the mass and delicacy of the equipment. The thicker the foam, the greater is the travel available for deceleration and the lower is the peak load on the equipment. However, foam thickness affects overall size of the case, so there is a balanced judgement to be made and, at CP Cases, this is based on years of successful experience of protecting a great range of equipment. When would you need custom-made foam protection? Whether for impact protection or orderly transport, foam lends itself to high quality presentation that reflects quality of the equipment and appropriate care. Combining different colours and laminating them provides many opportunities for sophisticated presentation of corporate logos, coded recesses etc. It is crucial for many professions to have all of the right equipment on hand at all times, whether you are a paramedic, soldier or builder. Protective foam cases provide a way to keep all the necessary tools, equipment and devices together avoiding loss and damage. Protective cases with foam engineered cushioning are almost always necessary for delicate equipment. Foam engineering is essential to protect equipment during transit and storage, which could be anything from military equipment in a war zone to a laptop [working in field research] or camera [recording a sporting event]. Foam shapes are designed from direct measurement of the equipment or from 3D data supplied by its manufacturer or scan data. Additional details, such as finger cut outs or clearances around delicate features, are added by the designer. As well as ensuring a high degree of protection for the contents, case inserts provide an attractive display solution. Various colour options or two-tone foam can be utilised to enhance presentation or promote a corporate brand. Logos and text can also be engraved into the foam, creating a unique, polished and original presentation. Your logo or text can be inserted with foams in multiple colours to help enhance brand recognition and differentiate your product from your competitors. The foam can be shaped by a variety of techniques including CNC routing, stamping, carving and sculpting. These can then be built up by lamination in various densities and colours. Custom-made foam protection is also essential to organise the contents of protective cases that hold tools that are of a non-standard shape. In these instances, the tools need to travel together but not loose, so a bespoke case design is required to keep each tool safely in place. In addition, it can hold a number of tools or components in an orderly manner so that they can be found quickly and efficiently. It will be apparent, at a glance, if any of the items is missing. This can be enhanced by using a contrasting colour in the equipment recesses. If you have any questions about foam protection or wish to discuss a bespoke foam design, contact CP Cases on 0208 568 1881 or by email at info@cpcases.com.